This Deluxe model is called the Custom Deluxe with metal front grill . A simple and quick way to increase your refrigerator cooling, simply install a add-on evaporator fins fan to any model. Make your refrigerator cold not just marginally cool. Fans fits any Brand or Model, with or without DC power to Refrigerator from a small single door to the large side by sides. 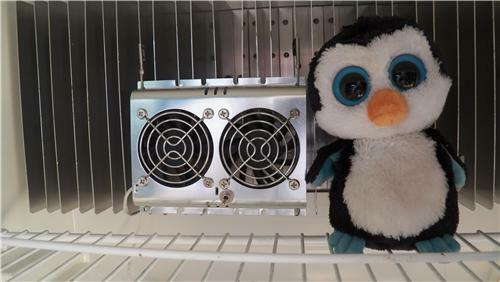 Mounting of Fans to evaporator will save money due to refrigerator cools faster. On most models the Fan wiring was designed to be a Plug n Play install. Some of the newer Refrigerators in RV's do not have the light for the quick hook up, so we have designed the fan to be wired either to light or to any 12 vdc source without any fan modifying. It will come with all terminals, so you can wire as needed.